Of course it is the strong wish of the pious faithful to make the vows with the loved one before God, not for romance but for the marriage to be blessed by God. Although non-Christians may not have a clear idea about God, most of them would agree that the church is an ideal place to solemnize the marriage covenant. The well-known marriage covenant used in church has a long history in human society. The bride and the bridegroom make the vows to each other: "…for better, for worse, for richer, for poorer, in sickness and in health, to love and to cherish, till death us do part." The bridegroom usually adds: "with…all that I have I share with you…"; and the bride: "…and to obey, till death us do part." In the early Church of England, wedding was held in front of the church door where the bride and the bridegroom exchanged vows. After the Reformation, wedding has since been held inside church. In Hong Kong, many young men and women solemnize their marriage with civil ceremony at Marriage Registry. Hong Kong Sheng Kung Hui well recognizes such marriages as the bride and bridegroom are required to exchange their marriage vows at the ceremony to be lawful husband and wife. For the Holy Matrimony in church, the officiating priest blesses the newly-wedded while the congregation prays for them and their new life. "Marriage is a gift of God in creation through which husband and wife may know the grace of God. It is given that as man and woman grow together in love and trust, they shall be united with one another in heart, body and mind, as Christ is united with his bride, the Church. "The gift of marriage brings husband and wife together in the delight and tenderness of sexual union and joyful commitment to the end of their lives. It is given as the foundation of family life in which children are born and nurtured and in which each member of the family, in good times and in bad, may find strength, companionship and comfort, and grow to maturity in love." It depicts the perfect marriage. Men and women who truly love each other would like their marriage vows to be like that. It is a pity that it seems that many couples find difficult to be together in good times and in bad, thus resulting in broken marriages. Although the Church still has faith in Christ's teaching: "till death us do part", in God's merciful love, the Church equally cares about those who would like to remarry after trying to salvage their previous broken marriages with no avail. The Book of Common Prayer points out: "Marriage is a sign of unity and loyalty which all should uphold and honour. It enriches society and strengthens community. No one should enter into it lightly or selfishly but reverently and responsibly in the sight of almighty God." Therefore any man and woman, who wish to get married in their parish church and be prepared for the new life together after marriage, will be first interviewed by the parish minister or be invited to taken part in a pre-marital counseling programme for better preparation. A marriage can only takes place after either a Notice of Intended Marriage to the Registrar of Marriages has been given or a Certificate of Registrar of Marriages has been obtained from the Registrar of Marriages. Marriage can be celebrated at a licensed place of worship by a competent minister where the presence of a Registrar is not required. The certificate of marriage is signed by the officiating minister. 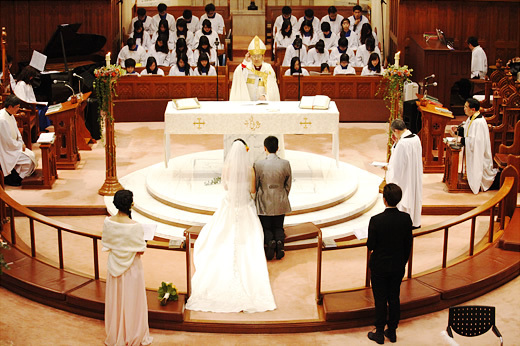 Many people are quite familiarized with marriage service in church. The bride and bridegroom enter into the church separately. The bridegroom and the best man enter into the church first. It is customary that the family and friends of the bridegroom sit on the right hand side of the church and the bride's on the left. At the beginning of the service, the bride walks down the aisle. She is accompanied by her father, or a person appointed to give her away. She is then given to the bridegroom. The bride and the bridegroom will stand at the chancel. The officiating priest prays for them and reads the Preface. To meet the legal requirement, the officiating priest, by reciting the wordings in the Book of Common Prayer, asks anyone in present who knows a reason why these persons may not lawfully marry, to declare it now. Then the priest asks the bridegroom and the bride in turn: "Will you love him/her, comfort him/her, honour and protect him/her, and, forsaking all others, be faithful to him/her as long as you both shall live?" Both of them respond in turn: "I will." The bridegroom and bride makes the traditional vows to each other: "…to be my …, to have and to hold from this day forward; for better, for worse, for richer, for poorer, in sickness and in health, to love and to cherish, till death us do part; according to God's holy law. In the presence of God I make this vow." The vows are sealed with the giving of rings and after which the minister, in the name of the Father, Son and the Holy Spirit, proclaims the bridegroom and the bride to be husband and wife united by God, and blesses them to live in the Grace of God. It is followed by the Prayer of Intercession offered by the congregation asking God to help the newly-wedded to start their new life. Some newly-wedded couples prefer marriage service to be combined with Holy Communion to symbolize their marriage as Christ is united with his bride, the Church, and to begin their new life with the body and blood of Jesus Christ.